Today we are going to share a wonderful social handle booster with you. The Facebook popup like box widget helps you to increase your Facebook business page likes.The social network boost is so important for you business. The increase in Facebook likes is guaranteed because of its functionality. This widget will popup to your website user when they visit your website, after page loads. The user will have an option to like your page with the like button or close it with the cross button at top-right of this widget. This widget comes with a couple of features; The faces of fans who already liked the page will be shown along with a number of likes on the page. The facebook page title along with like button will be shown also. 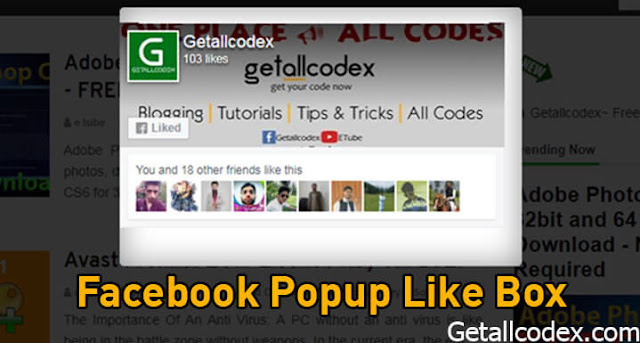 Replace the Getallcodex with your facebook page user name. This popup will appear after 1 second when a page fully loads. Replace the .delay(1000) with your desired time you want to show it. The value 1000 means it will appear after 1-second page loads. Similarly 10000 means it will appear after 10 seconds, You can choose your desired one. By default, this pop-up widget will appear one time only when a user visits your website. If you want to show it each time page loads then remove the following piece of code from the above code. The post was about the facebook popup like box widget hopefully you would have liked it also. I am hopeful that this widget will help you increase your facebook page likes. If you're stuck or having trouble regarding the installation of this template then leave a question below. I will answer your questions. To get more widgets like this you can subscribe our newsletters for free. To subscribe use the "Follow by email" widget thanks.